I have a 2007 320CDI with 142k that has a growl from the rear that gets louder with speed. The noise levels out at about highway speeds. Looking under, I found the differential bearing at the left half shaft to have radial play, maybe 0.5mm, total. The right side is fine. It is definitely the bearing inside the diff., not the axle CV/coupler. Does anyone have experience with this they can share? 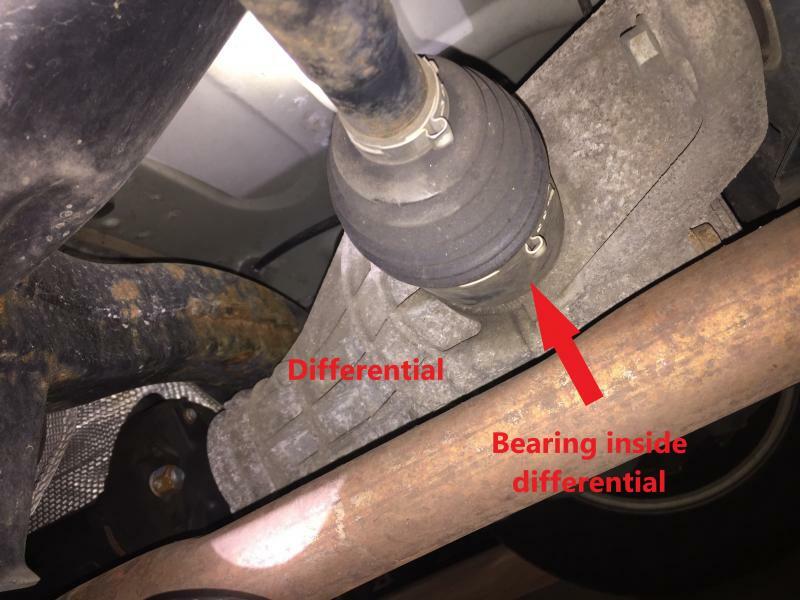 Is the bearing serviceable without entire diff rebuild? Last edited by 43sqd; 03-23-2019 at 03:25 AM. Thanks for the speedy reply, 43sqd. It looks like the instructions you sent are for the outer bearing, at the wheel. My bearing play is at the inboard end of the axle shaft, inside the differential. See annotated picture. Do you have any information on that bearing? I can't find anything on a 230CDI. Is it a 320CDI? If so, please update your profile to indicate that. Well... it is R&I for the seal. I feel play in the left side bearing in the differential that I am thinking is making the growl. I will put the vehicle on 4 jack stands this weekend and (carefully) run it in drive, trying to find out where the growl is coming from. I was interested to see if anyone else has a similar problem. It does not get louder with turns or accelerating or engine braking. Thanks for all the help. I will let you know how it goes this weekend. No, it is not. Differential is serviced as a unit. There are no specs or repair instructions. Driving lifted may not reveal too much. With no load it all may be nice and quiet. Traction system will try to take action applying brakes to wheels that turn faster. Multiple faults in traction system will follow. Well... it is R&I for the seal. To me the left and right seals look like bearings. Look at the roller balls on both.